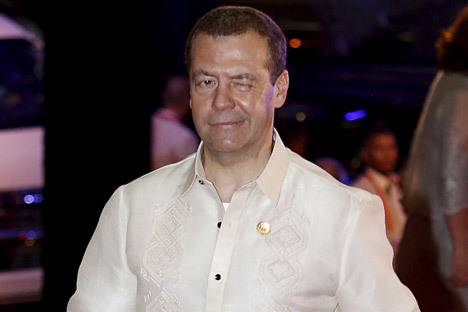 Russia's Prime Minister Dmitry Medvedev winks as he arrives in a traditional Philippine "barong" shirt for a welcome dinner during the Asia-Pacific Economic Cooperation (APEC) summit in the capital city of Manila, Philippines November 18, 2015. China and Russia are planning to sign space, aviation and nuclear energy deals when Russian Prime Minister Dmitry Medvedev visits China next week, Chinese Vice Foreign Minister Cheng Guoping was cited by Reuters as saying. Guoping did not give any details on the agreements, according to the report. Medvedev will be in China for a meeting of the Shanghai Cooperation Organization (SCO).